Stocks in London are seen opening lower on Monday as global trade tensions refused to dissipate. Worries about trade wars weighed on investor sentiment as G20 finance ministers issued a warning on Sunday that "heightened trade and geopolitical tensions" posed an increased risk to global growth. In addition, the International Monetary Fund warned Saturday that the growing trade war between the US, China and the EU could significantly harm the global economy. 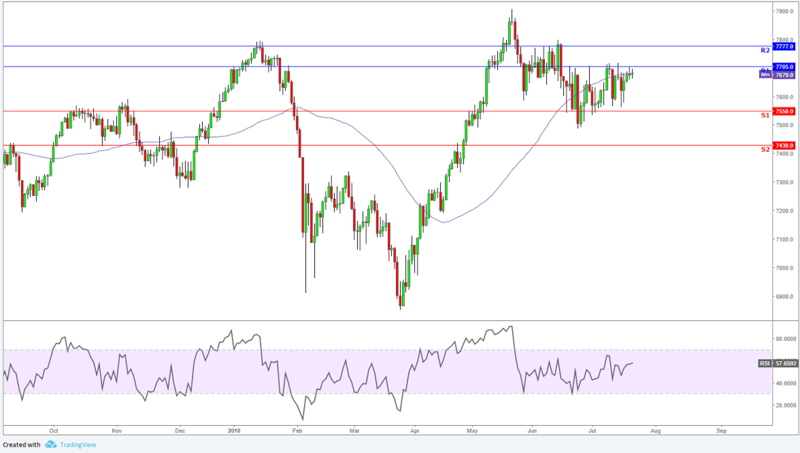 We are trading currently below the 50-day moving average and at the high end of the range, however the expectations for today are to the downside and a retest of the 7570 support level.